Have you ever wanted to try making your own herbal soaps? Now you can! Dr. Petley is not only a licensed naturopathic doctor, he is also an experienced soap maker! 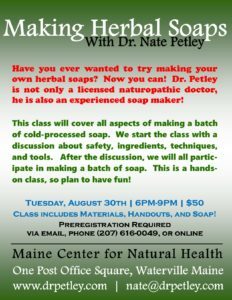 This class will cover all aspects of making a batch of cold-processed soap. We start the class with a discussion about safety, ingredients, techniques, and tools. After the discussion, we will all participate in making a batch of soap. This is a hands-on class, so plan to have fun! Class includes Materials, Handouts, and Soap!